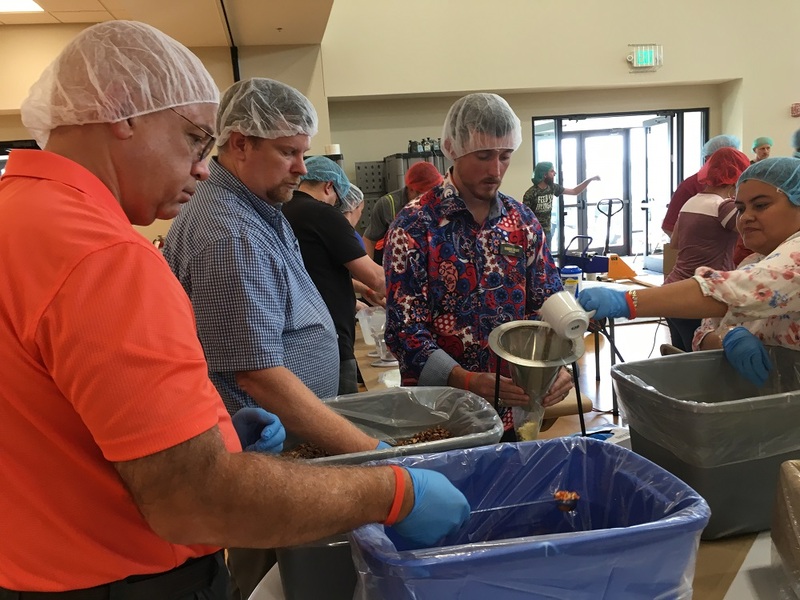 BURLINGTON, N.C. – A total of 450 volunteers from National Agents Alliance and Foresters Financial™ joined forces with Feed The Hunger to prepare more than 114,000 meals during a “Pack-A-Thon” at The Lamb’s Chapel airport campus on Thursday, July 27. The event will provide nutritious meals to feed children and families in Alamance County and beyond. 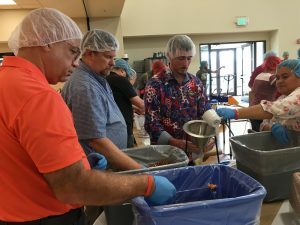 The 114,000 meals will set a single-shift record for Feed The Hunger and will surpass the more than 70,000 meals NAA and Foresters packed last July. During the event, volunteers were split up into teams and put together food packets. Each nutritious meal consists of four ingredients – dehydrated vegetables, a scoop of pinto beans, vitamin powder and rice. These ingredients, which together provide complete nutrition, are packaged in six-serving meal packets that are then weighed, sealed, and boxed. Each year, NAA and Foresters Financial hold a “Delivering the Difference” event prior to one of NAA’s national events. This year, The Alliance’s “Family Reunion,” is taking place on July 28-30, 2017. The Alliance has volunteered at Christmas Pack-A-Thons for Feed the Hunger for the past eight years, and this year, Feed the Hunger was selected as the Delivering the Difference beneficiary. Albright said supporting local organizations like Feed the Hunger is part of The Alliance’s mission to “Have fun, make money and make a difference.” In two short hours of volunteering, Albright said the impact from this event will be massive. NAA and Foresters Financial have a rich history of giving back to local families and communities. Previously, Delivering the Difference events have supported organizations like the American Red Cross™, the Boys & Girls Club, and KaBOOM!. In addition, volunteers have given back through school refurbishing projects around the world. National Agents Alliance is a dynamic Insurance Marketing Organization with agencies located across the United States, offering a variety of financial services products. National Agents Alliance started in 2002 and has experienced fast growth that is sustained through highly specialized client service, lead generation services, client referrals and a performance-based compensation program. Foresters Financial™ is an international financial services provider with more than three million clients and members in the United States, Canada and the United Kingdom, and total funds under management of $44 billion.1 With a history of more than 140 years, we provide life insurance, savings, retirement and investment solutions that help families achieve their financial goals, protect their families and improve their communities. For more information, visit foresters.com.